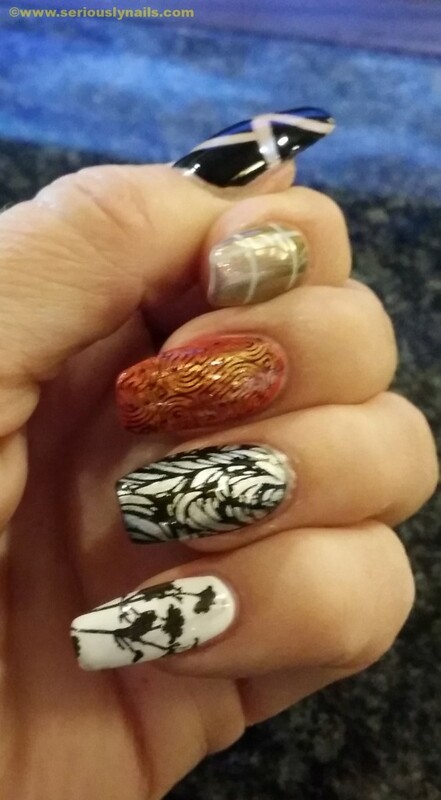 Again, while in Aurora, CO, I found some cool new (to me) stamping plates from Young Nails. 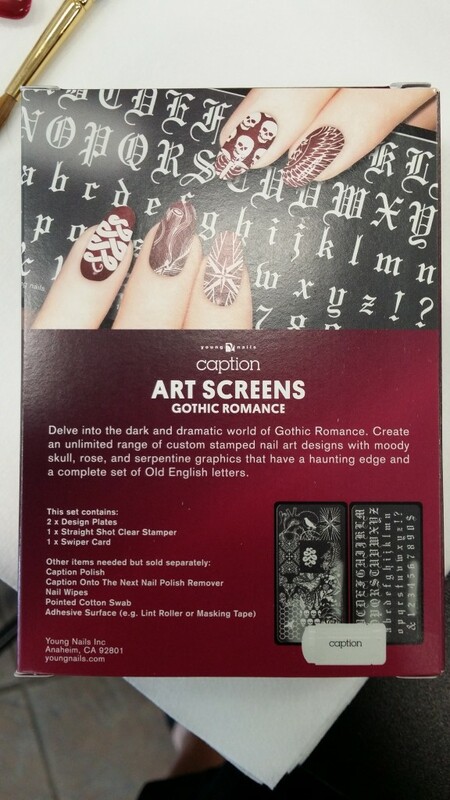 Gothic Romance available at Salon Centric! I really like the fonts!!!! 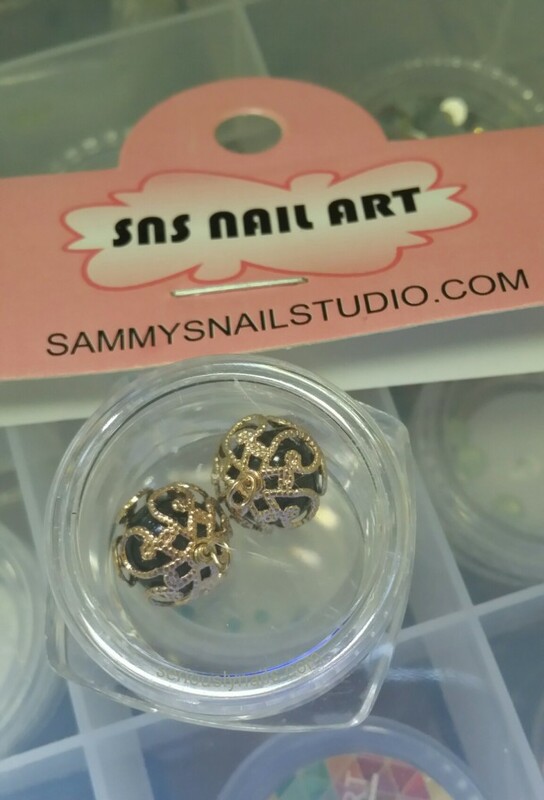 In the early years of my career in the nail industry, one of the hot things to have on your nails were “nail bolts” and “nail charms”. 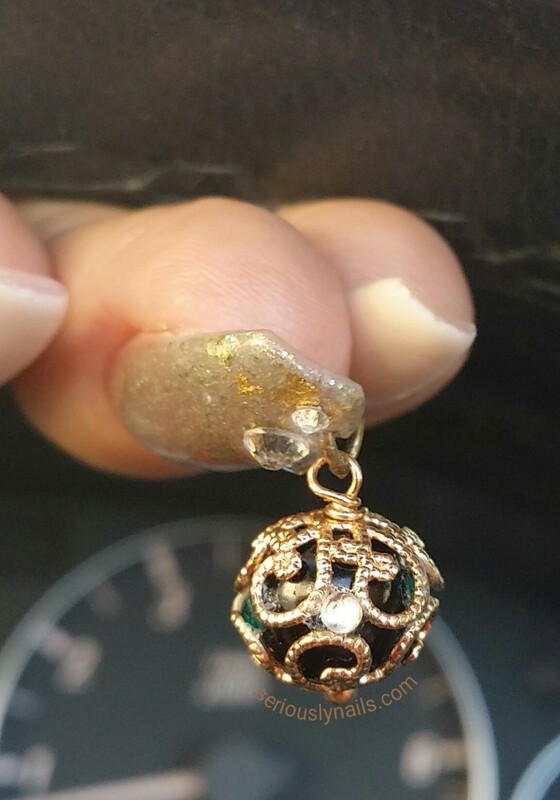 Both “nail bolts” and “nail charms” required a “drill” to create a hole in your nail that you either put the bolt through or the ring for your charm. I am currently obsessed with the re-emergence of nail charms. 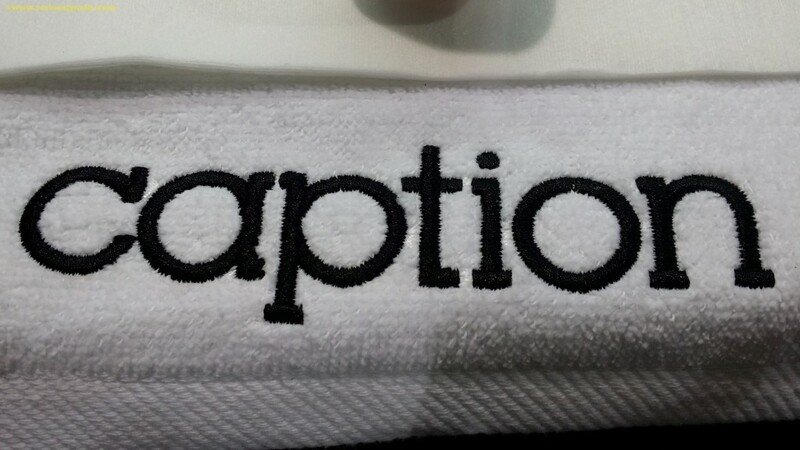 I found this one while at IBS Las Vegas from a company called SNS! Oh, I added some extra bling to the charm using Bling On as well. Gotta have some sprarkle! Well, I have to say that I am super excited to be heading to Orlando Florida for my first ever Premiere Beauty Show. The show is being held at the Orlando/Orange County Convention Center-West Complex is located at 9800 International Drive, Orlando, FL 32819. It starts on Saturday, May 30th with classroom education and the show floor opens on Sunday, June 1 from 9 – 6:30 Monday, the 2nd of June, the show floor is open from 9 -5, so there is plenty of opportunity for making that just perfect purchase. 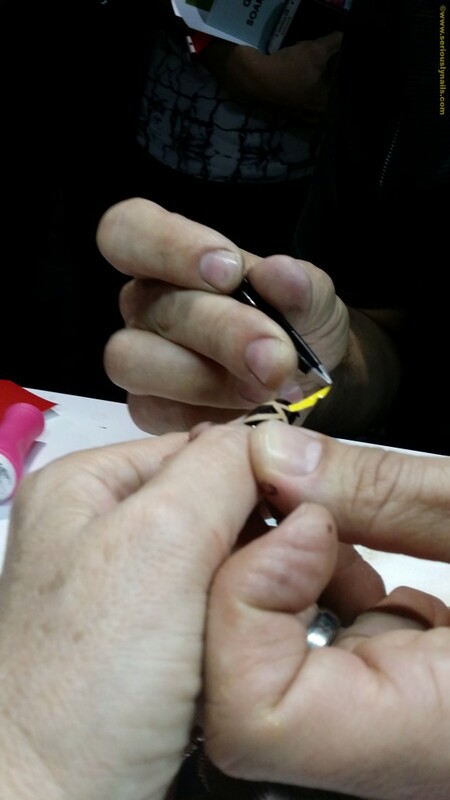 There is literally 9 pages of Nail Manufacturing companies that are either teaching or will be on the show floor. 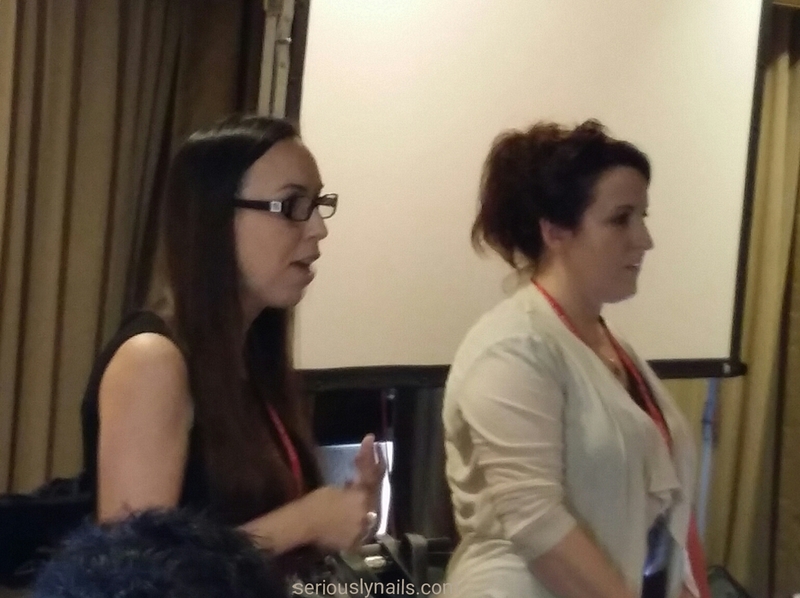 And not just manufacturers but business seminars with the likes of Tina Alberino and Jamie Schrabeck. 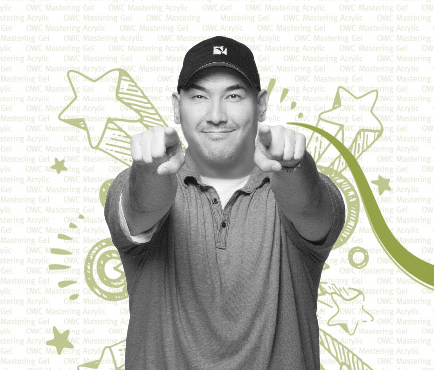 Dynamic companies such as Young Nails, Greg Salo will be giving classes. Now there is a dynamic fellow!!! Linda at work showing IBX during a certification class. 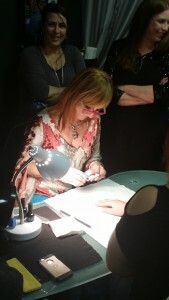 And it looks like Amber Trawick, who competed on Nail’d It will be there teaching nail art ideas and techniques. OK, so I could go on and on and on but I will stop and give you the link to be able to see the 9 pages for yourself. I, of course will take plenty of pictures and have good things to blog about when I return. Here is the link for you. I’m off to do my nails for the show!!!!! Caption by Young Nails-plus a little Something Something! 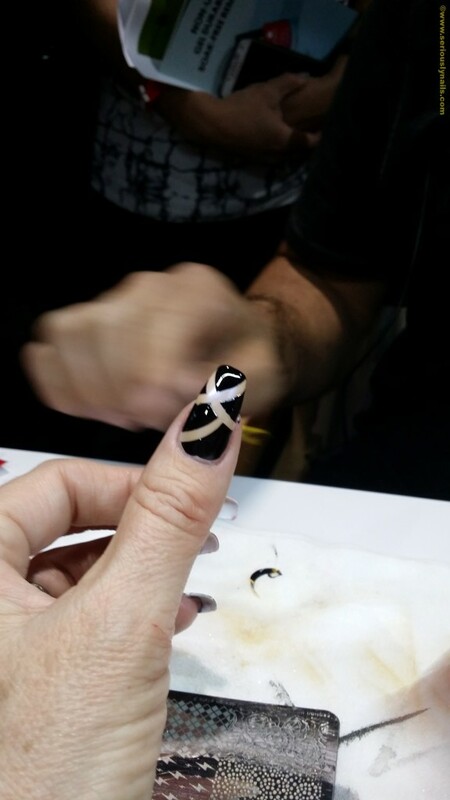 Awarded with the “Best New Nail Product” at ISSE Long Beach this past month, Caption has put another notch in it’s belt! 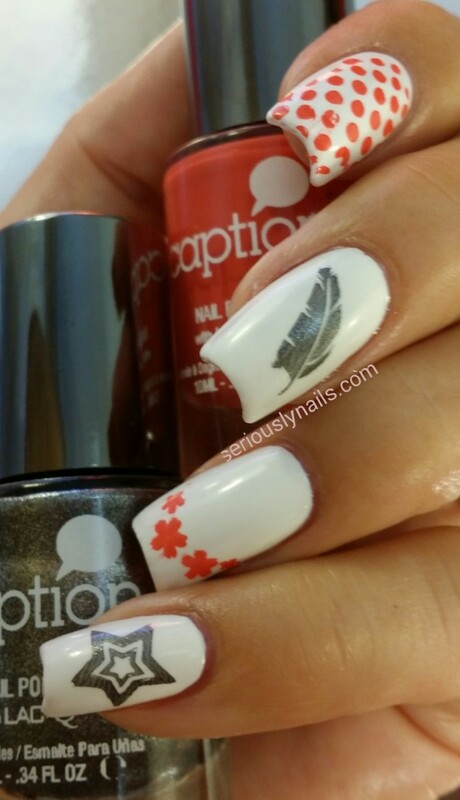 I find that Caption is one of the most heavily pigmented lacquers out there and therefore it is PERFECT for stamping. 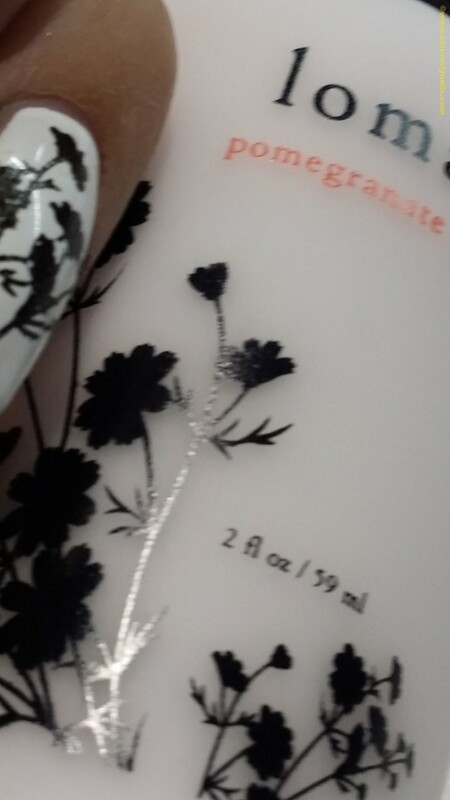 The other great reason to use Caption (for stamping among other things….like fabulous color selection) is the dry time. 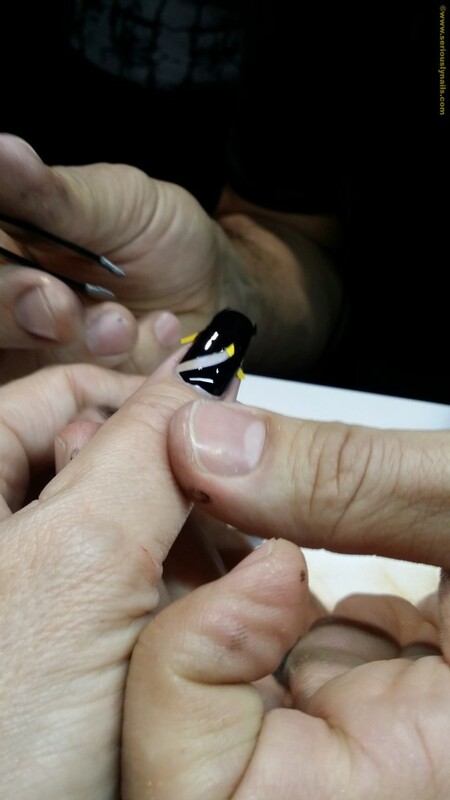 He demo’d 5 different nails for me using some old tricks like this one! remember the order you placed the french tip guides and remove them in that order! So super pretty, fast and easy to create. As well as the newest addition to Young Nails line up! (Seriously excited about these!!!) 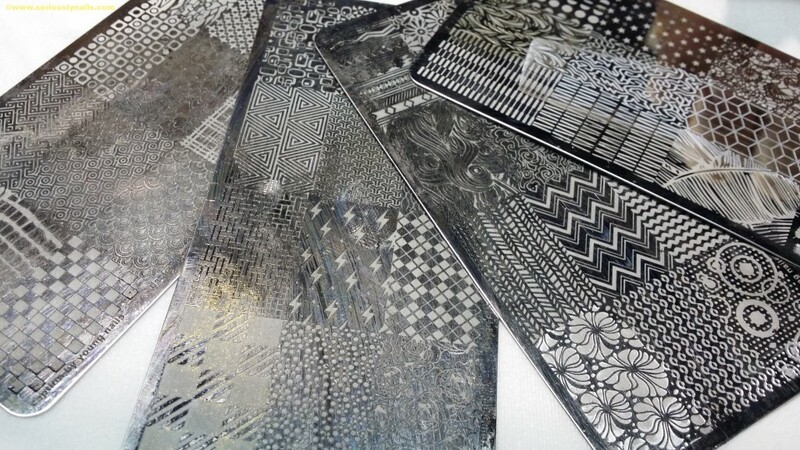 Stamping Plates. But listen not just ordinary stamping plates. There was a lot of though put into these lovelies. Like the depth of the design, and the size of the design on the plate. 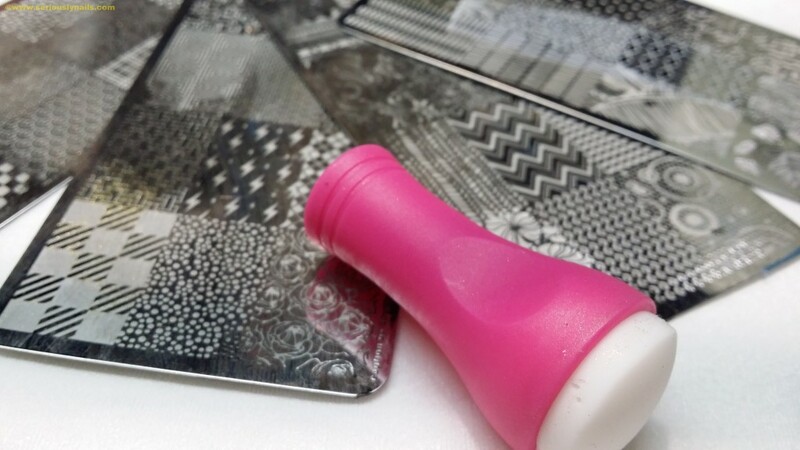 Then there’s the stamper (including both the material it is made of as well as the size of it), plus it is designed to be used with Caption. Yes, the same super highly pigmented one I mentioned earlier! 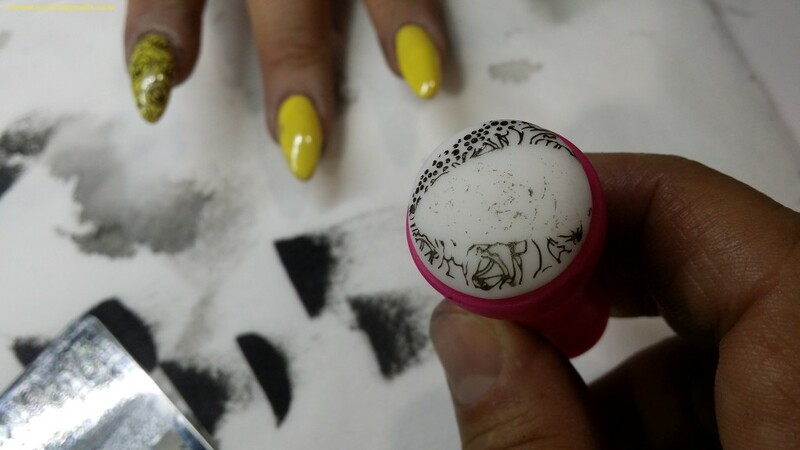 Look at the size of the stamper plate design….huge and the stamper itself is large enough to pick up a great amount of the design. And that’s a long nail he applied that to! 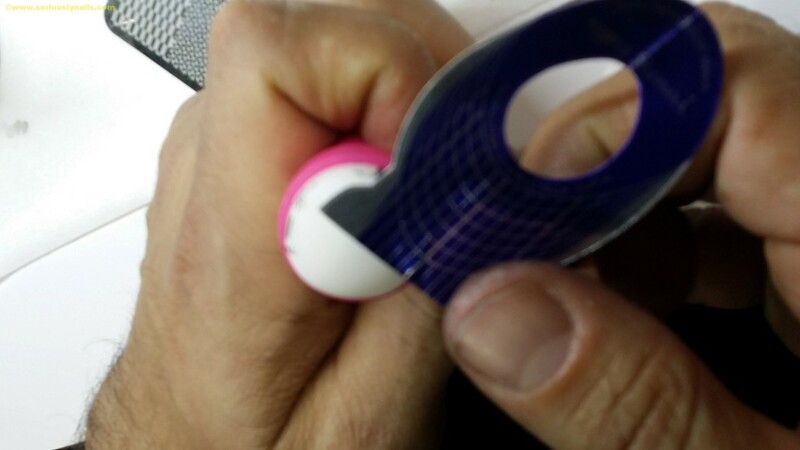 Yes, he is using a nail form like a lint roller to remove the Caption that remained on the stamper head. Smart! 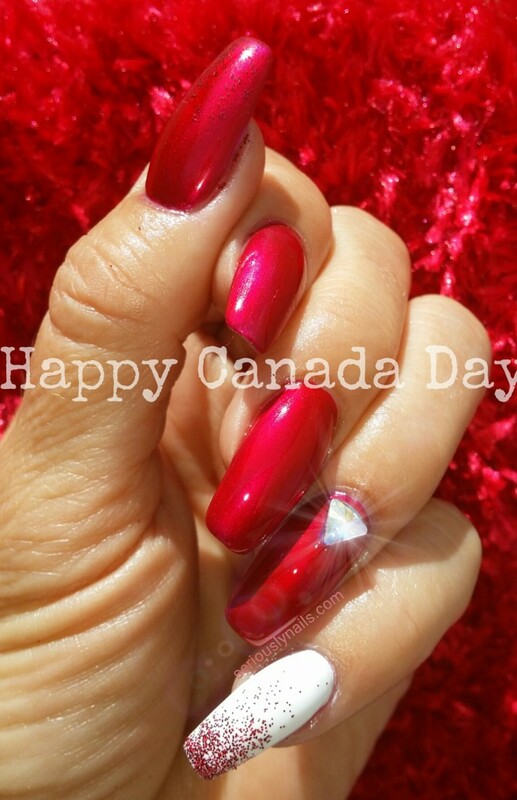 (I’m not sure if this will work with other polishes-I should try that- but I think it is probably got to do with the chemical make up of Caption. My apologies about the picture being so cropped! 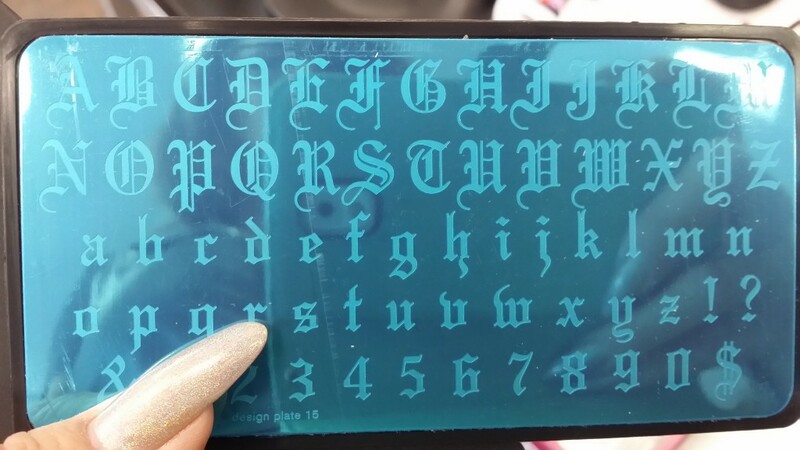 So the bottom line is that Greg was showing us these amazing plates and some other great tricks to do with Caption, the stamping plates/stamper and some other tools (think gold dust) but they weren’t ready for sale yet during the show. there’s gold dust in that nail! 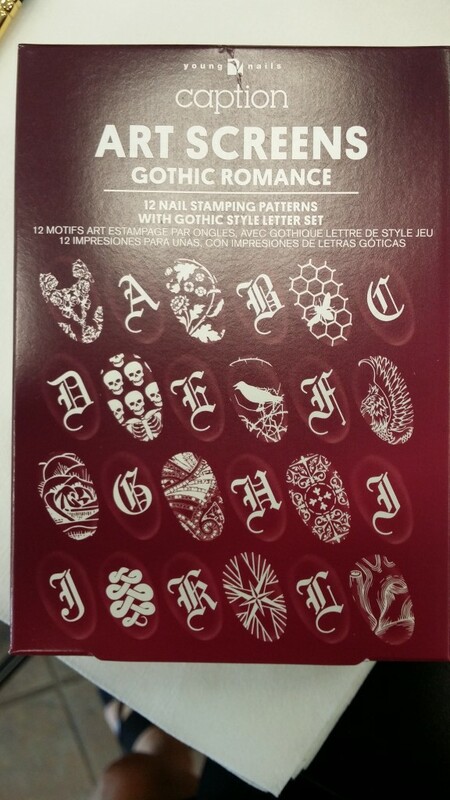 I am hoping to hear from them soon about the availability of the plates and the stamper. I for one am busting to try these in person! 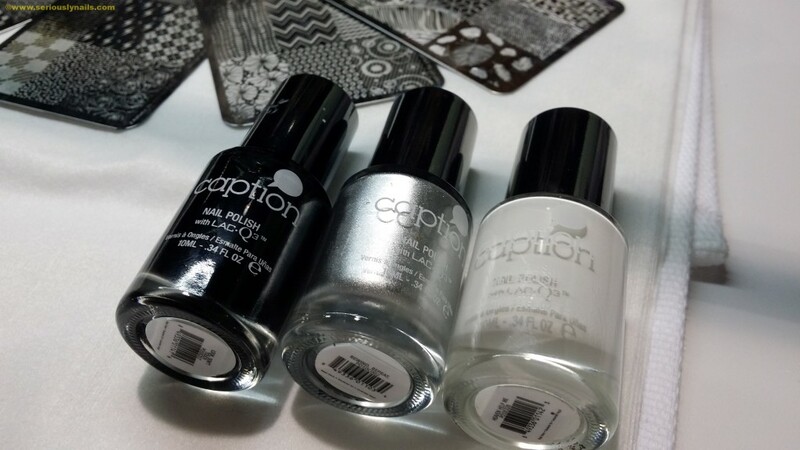 If you knew me last year, you would have seen my stamping issues and how I found Caption to be a great stamper lacquer! Here is a pic from that time. Keep checking, I will let you know when they are ready for purchase! Check out the other great products, including education that Young Nails offers!